1975’s ABBA LP was my very first ABBA record. I received it for Christmas 1975, having fallen in love with the song ‘Mamma Mia’ (a story I wrote about here in Still my favourite song). There are times, particularly on a sunny summer morning, when listening to the album brings that feeling of my 12-year-old self hearing the album for the first time. I still love this album. To me this is everything that ABBA is. Ring Ring and Waterloo showed signs of a group under development. With this, the group’s third album, they finally found their signature sound. ‘Mamma Mia’ is, of course, my favourite of all ABBA songs. But there are so many classic moments – pure ABBA brilliance in ‘SOS’, ‘Bang-A-Boomerang’, Mamma Mia’ and ‘I’ve Been Waiting For You’, a little light social commentary in ‘Hey, Hey Helen’ and ‘Man In The Middle’, a touch of reggae and whimsy (and Benny’s accordion) in ‘Tropical Loveland’, a bit of nostalgia in ‘I Do, I Do, I Do, I Do, I Do’, contemporary glam rock in ‘Rock Me’ and ‘So Long’, and Benny gets a showcase of his classical influences in the instrumental ‘Intermezzo no 1′. That was the summer of the ABBA album in Australia. I remember riding my bicycle around the neighbourhood and hearing ABBA songs blaring from stereos in house after house. A sure sign of the universal love that Australia had for ABBA in those years in the mid-70s. Last week Mamma Mia! returned to Sydney for the “10th Anniversary Tour”. Friends will know that the first time I saw Mamma Mia! (world premiere, London, 6 April 1999) I hated it, thought it was tacky and pantomime like, thought it would not last more than a few months and would never travel beyond the UK. It seemed a very “British” thing. And I wasn’t the only one. So now we have a touring version back in Australia. A smaller ensemble and band, but the cast are obviously having a lot of fun on stage, which is quite infectious. Several cast members from the original Australian production have returned to the same roles. Premiere night saw a smattering of local celebrities (Senator Bronwyn Bishop was right behind us, I caught her eye during the encore). For more information go to www.mamma-mia.com.au. See here for some reviews and news stories. Today’s Daily Telegraph newspaper (Sydney, not UK) featured an article about ABBA fans getting together to celebrate ABBA in the lead up to Mamma Mia! returning to Sydney. I was there (back row, second from the left) with friends Mark, Cotton, David, Sandra, Louise, Gary and Jason. It was a fun night at the Gourmet Viking Scandinavian restaurant in Enmore. Some brought along their old memorabilia to inspire conversation. You can see some of it in the photo. The article was great, and thankfully didn’t make us look like a bunch of loner freaks who live in the past. Some great stories were shared – a shame that not everything could have appeared in the article, though some really good stuff did. Modesty restrains me from saying what it says about me ;-), though it does mention my recent trip to New York for Kristina. Thanks JP, Alex and Katrina. Tags:ABBA, ABBA fans, Daily Telegraph, Gourmet Viking, Mamma Mia! 2008 turned into one of the most phenomenal years in ABBA’s 36 year history, another peak in the ongoing ABBA revival. Of course, this was mainly due to the film version of the musical based on the songs of ABBA, MAMMA MIA! Following its premiere in London on 30 June, the movie became the number one film in many countries, even up against such blockbuster fare as the Batman sequel The Dark Knight. MAMMA MIA! has gone on to break box office records, becoming the highest-grossing film ever in the UK. The movie divided critics and fans, but there’s no denying that it propelled ABBA back into the limelight. To date it has grossed more than US$570 million. The Stockholm premiere of MAMMA MIA! on 4 July saw that rarest of events, the four former ABBA members at the same place at the same time. Agnetha and Frida danced together with actress Meryl Streep on the red carpet, and for the first time in over 22 years the four were photographed together, albeit alongside the film’s cast and crew. This disappointed many, but within hours Photoshopped pictures of “the ABBA reunion” (like the one above) were spread around the world. 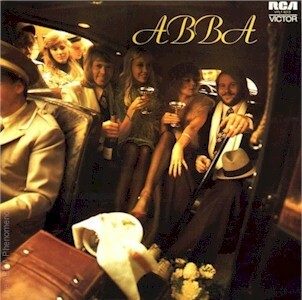 The movie’s soundtrack CD was also a huge hit, topping the Billboard Album chart – the first ABBA-related album to top the US charts. The recently released DVD has already broken sales records in less than two months. ABBA’s original recordings also made an impact this year, with the flagship compilation ABBA Gold topping the chart again in the UK, becoming the oldest number one album ever, and it also topped the Billboard Pop Catalogue chart for the first time. Other compilations including The Definitive Collection, Number Ones, 18 Hits and even the new box set ABBA – The Albums made chart appearances. Updated versions of ABBA Gold, More ABBA Gold and the box set Thank You For The Music attracted new buyers, as did The Albums box set. A vinyl reissue of ABBA – The Album commemorated the 60th anniversary of the 12 inch 33⅓ rpm long-playing record. Agnetha released a new double CD compilation of her Swedish and English solo songs, My Very Best. Many unique ABBA books were released during the year, including ABBA & Me (a Dutch fan’s story), Historia de ABBA en Argentina, Made in Suécia: o paraíso pop do ABBA (from Brazil), ABBA Let The Music Speak (a musician’s guide to ABBA), ABBA: The Scrapbook (a pictorial history), ABBA – The Story (the first full-length ABBA biography in Swedish, also in Norwegian and Danish versions), plus an updated version of the definitive English biography Bright Lights Dark Shadows. Stig Anderson’s daughter Marie Ledin wrote a memoir of her father, Min pappa hette Stikkan. Benny denounced the anticipated tell-all, but in reality it was a loving tribute without the expected salacious gossip about the split between Stig and ABBA. ABBA also joined the lucrative games market, with Singstar ABBA for PlayStation. For a group that came to an end 26 years ago, that’s a lot more action than could be expected over many years, let alone all in one. In sad news, drummer Ola Brunkert died in March at the age of 61 following an accident, and photographer Bengt H. Malqvist died in November at the age of 80. And what of the future? There are those, including Benny himself, who see ABBA as over after this year. 2009 sees the 10th anniversary of the stage musical MAMMA MIA! along with the 35th anniversary of ABBA’s Eurovision Song Contest win; no doubt there will be commemorations for the twin anniversaries. ABBA’s Voulez-Vous album was released 30 years ago in April, and if past history is anything to go by, we may get a Deluxe Version of the album. ABBA the Museum was to open in Stockholm in June, but due to problems with the site the opening has been postponed indefinitely. In the meantime the museum’s collection will be touring the world. Benny Anderssons Orkester (Benny Andersson’s Orchestra, or BAO) will tour Sweden again in the northern Summer, and will also perform its first-ever concert in London in July. There is also talk of an English-language album – some songs have already been recorded. Björn, Frida and Agnetha will probably remain as they have for the past few years, mostly maintaining their private lives with the occasional public appearance. And while the music lives on, so will ABBA. 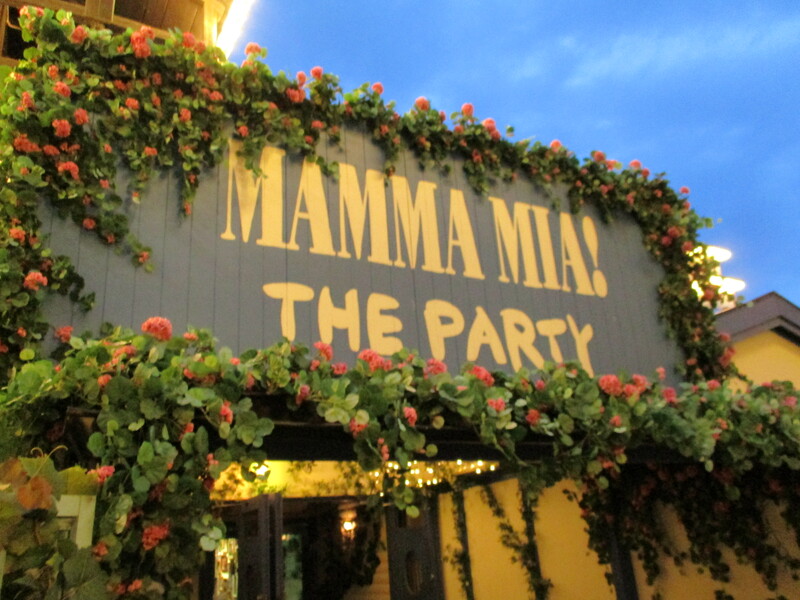 Last night was the Australian premiere of MAMMA MIA! in Melbourne. 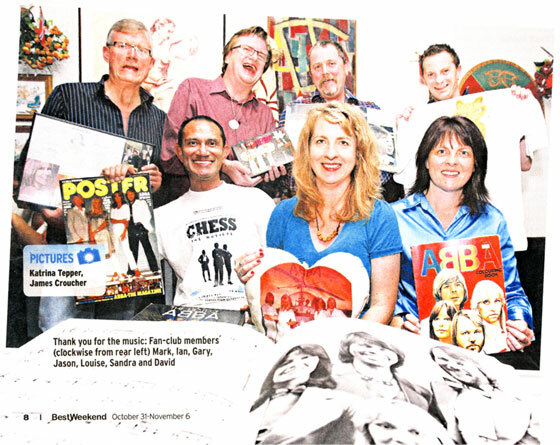 Thanks to Helga and the ABBA Fan Club, I was lucky enough to attend the premiere and after party, with old friends David, Manuel, Mark and Terri and new friend Jason (who told me he’s a regular ABBA World blog reader – hi Jason!). The evening started with the red carpet arrivals and pre-movie champagne in the foyer. We could watch the arrivals on a large screen, though we couldn’t really hear what was being said. Anticipation was high waiting for the arrival of stars Meryl Streep, Colin Firth and Dominic Cooper. We got to see them on the screen, and live from three stories up, before being ushered into the cinema. Every seat in the cinema had a MAMMA MIA! bag with lots of goodes – chocolates, skin care products, make up, discount vouchers, and a MAMMA MIA! THE MOVIE iPod nano sleeve, in glorious pink! Once everyone had taken their seats, the three stars were introduced and said a few words from the front on the cinema, then Meryl took her seat in the cinema (five rows behind our group) for the movie, while Colin and Dominic left. The movie got a great reaction from the audience, with spontaneous applause after several songs. Everyone called out “yeah” when, in the “megamix” section at the end of the film, Meryl as Donna asks us if we want another song. During ‘Waterloo’ streamers and confetti were shot out over the audience, matching what was happening on screen. When the megamix ended and ‘Thank You For The Music’ started, Meryl left the cinema to a standing ovation, giving a little bow and wave on the way out. Then we were all bundled on to buses to go to the after party at Alumbra at Docklands. The stars were unfortunately mostly inaccessible. First they were in a separate room upstairs, then hidden away in a roped-off corner with security. Colin Firth was kind enough to be photographed with some eager female fans, while Dominic Cooper appeared on the dance floor momentarily and gave autograph and was photographed with fans – I was lucky enough to get one of each. Meryl Streep was hardly seen until near the end of the party, when she was rushed out by her entourage and didn’t acknowledge people calling out her name for a photo opportunity. Drag queen and singer Courntey Act performed a medley of ABBA hits including ‘Gimme! Gimme! Gimme! (A Man After Midnight)’ and ‘Mamma Mia’, to backing tracks that sounded like Abbacadabra. This was the first ABBA music of the night, which then led to half of dozen of so real ABBA songs before returning to standard 70s disco music. A few more ABBA songs were played later on, each one filling the dance floor immediately. There were a few local celebrities in the crowd. Mark Holden (former pop singer and Australian Idol judge), Tim Ferguson (of the Doug Anthony Allstars), Tim Campbell (Million Dollar Wheel host), Hamish and Andy (of radio and TV), apparently other stars of TV that I didn’t recognise. Rhonda Birchmore, Lara Mulcahy and Joylon James who played Tanya, Rosie and Sky in the Australian stage production were also there. (Mark Holden has a previous ABBA connection: his 1976 hit ‘I Wanna Make You My Lady’ was an English cover of a Ted Gäredestad song. Ted was a Polar recording artist whose early albums were produced by Benny and Björn). MAMMA MIA! opens in cinemas across Australia (and New Zealand, Norway and the UK) today. Last night saw the long anticipated ABBA reunion – sort of. There had been speculation for several weeks that “ABBA would reunite” for the Stockholm premiere of the MAMMA MIA! movie. Many had predicted that all four would not turn up, or all would turn up but remain separated (myself included), as they did when the musical opened in Stockholm in February 2005. Anni-Frid, Agnetha, Benny and Björn appeared on the balcony of the Hotel Rival, alongside the lead actors from the film and the director, producer and screenwriter. Though they still managed to remain separate – Benny and Björn to the far sides of the group, Agnetha and Frida together in the middle. Much to the delight of ABBA fans everywhere (and the attending media) Frida and Agnetha together embraced star Meryl Streep on the red carpet, and then the three joined together in a circle dance. Video can be seen at Aftonbladet and probably all over YouTube. As fabulous as it is to see Agnetha obviously enjoying herself with her former collegues, I do wish she would get herself a stylist when she goes out in public. She has worn this same outfit of white top – with a hint of black lace showing from underneath – and black pants for at least two or threee of her recent reported public outings, and it’s not particularly flattering. We all remember that black wrap-around mesh thing she wore to the stage musical’s opening in 2005. Women of a certain age should not go sleeveless. She’s still an attractive woman, she just seems to want to dress down her image. This is the first time the four ABBA members have been seen together by the wider public since singing ‘Tivedshambo’ on video for a Stig Anderson television tribute in January 1986. Though it is not the first ABBA reunion since then – they have sung together several times for close friends’ birthdays, the most recent known occasion was Görel Hanser’s 50th birthday in June 1999. See ABBA World’s MAMMA MIA! THE MOVIE mini-site for the latest news on film premieres.